Hi! I am Miss Jaime and I’ve been a Long Island pediatric OT for eighteen years. I currently work in a public school in Nassau County with students from Kindergarten to 5th grade. I also have ten years experience working in a sensory gym part time with preschool age children. Before I moved to the elementary schools in my district, I worked full time in the middle schools for five years. I work per diem in a hospital with adults as well. That sounds like I work a lot but I love OT and being an OT! 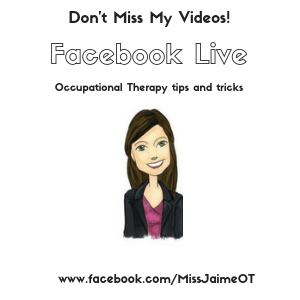 One of the things I love about Occupational Therapy is the fact that it is always changing. I love to find new ways to work on my students’ deficits to keep it fresh and interesting for them (and me)! I have a Bachelor’s degree in Occupational Therapy from Utica College and a Master’s Degree in Special Education from Adelphi University. I love yoga and became certified through the American Aerobics and Fitness Association to teach group exercise. After a year of teaching yoga, I realized I like to DO yoga more than I like to TEACH it! However, I still love yoga and I think it is a great way to work on strength, balance, bilateral skills, etc. I use it with my students all the time. As a school district OT, I work with both general and special education children in ten buildings. I have students with Autism, Down’s Syndrome, Learning Disabilities, Sensory Processing Deficits and more. I also work with the teaching staff using the RTI model to address the needs of general education students who don’t receive OT. Sometimes a simple trick like changing the child’s seat height is the ticket to success! I am certified in Assistive Technology through California State University Northridge. I am excited to have a new aspect of O.T. to explore. I am also a Certified Handwriting Specialist through Handwriting Without Tears and PuzzleArt Therapy. 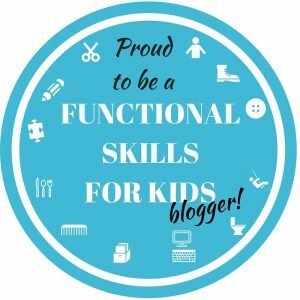 In 2016, I teamed up with nine other pediatric OT and PT bloggers to start the Functional Skills For Kids team. 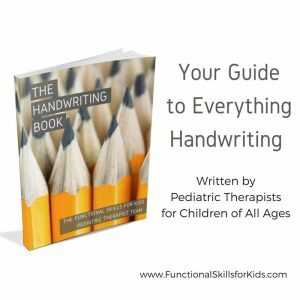 We recently published our first book, “The Handwriting Book“ in January 2017 and “The Scissors Skills Book” in June 2017. I hope you’ll check out our webpage because we offer tons of freebies and promos during each launch. We have ten other books coming out! 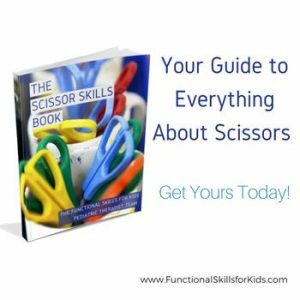 Click here to visit Functional Skills for Kids. For the past two years, I have been working with graduate Occupational Therapy students from Touro College in Bayshore and Manhattan to conduct research within the school setting. This has been such an exciting endeavor for me. I’m learning so much! I am a passionate Occupational Therapy advocate. 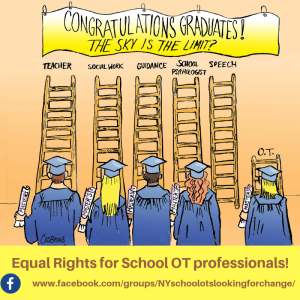 I am the creator and administrator of the Facebook Group “USA School-based Occupational Therapists Looking for a Change“, “NY School-based Occupational Therapists Looking for a Change” and “School-based OTs and PTs working in Long Island“. You can learn more about our mission here. I have presented locally at the New York State Occupational Therapy Association Conference as well as the American Occupational Therapy Association Conference about Occupational Therapy advocacy within the school systems. We deserve equality. 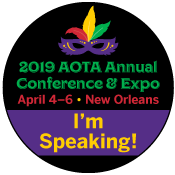 I look forward to presenting in New Orleans this year at the 2019 AOTA conference. Honored to win an award for service from the New York State Occupational Therapy Association! Broadcasting my advocacy initiative on the OT Schoolhouse Podcast. My debut in the Utica College News! So lovely to place in the Top Ten Pediatric Occupational Therapy Bloggers of 2018. Miss Jaime, O.T. mentioned in the Open Journal of Occupational Therapy. Fortuna, Jennifer MS, OTR/L (2016) “PuzzleArt Therapy: Connecting the Pieces in Search of Answers,” The Open Journal of Occupational Therapy: Vol. 4: Iss. 4, Article 14. Want to read about “A Day in the Life of Miss Jaime, O.T. ?” I was so happy to be featured on “OT Cafe” blog as a guest blogger for Abby, Pediatric OT. 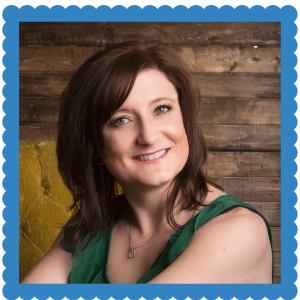 What an honor, as Abby’s blog was one of the first OT blogs I followed! I was also featured in the September spOTlight series on “OT Mommy …needs her coffee”. Spencer, J. (2016). Ten reasons every OT practitioner should go to #AOTA17. OT Practice, 22(4), 16–17. Spencer, J. (2015). Music Therapy: Clapping games are an amazing way to work on motor skills. Alla Breva, 39. I would like to inquire about special needs yoga. Do you have any classes on Long Island ? My 3year old son checks off every single box on every SPD symptom checklist I’ve seen. He’s currently in Tiegerman in Glen Cove, a preschool for children with language delays, and does receive OT twice a week there. However, I’m not exactly feeling heard from school staff and they don’t seem to picking up on the severity of his sensory issues. Any suggestions on where I go from here? Should I take him to OT after school hours?